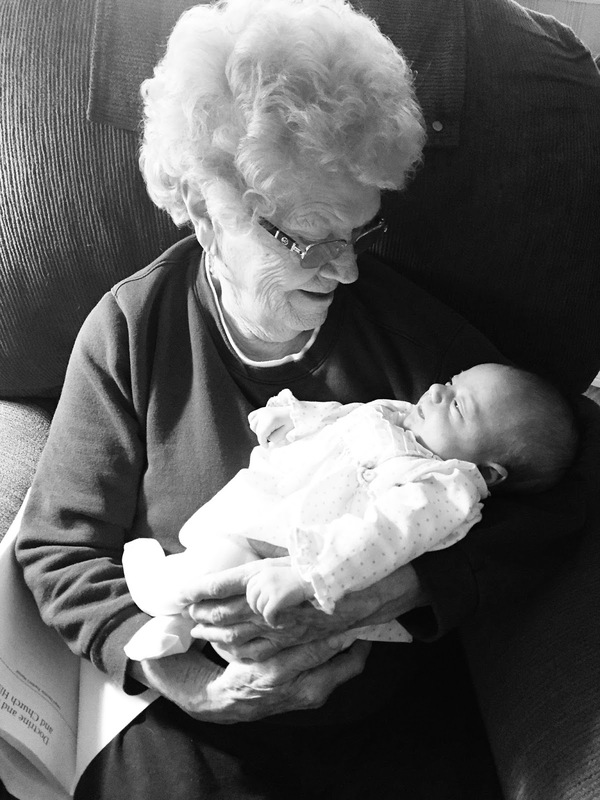 Sadie got to meet her great-grandmother a few weeks ago and it was such a sweet and special experience for me. When I walked in to my Grandma's house, my Grandma was was reading her Sunday School lesson for the next day at church and all around her home were pictures of loved ones, gorgeous handmade quilts, and a garden outside full of bright and beautiful flowers. My mom had driven with me and she had just come from a women's meeting where she has stewardship over most of Eastern North Carolina. That day really struck a chord in me about how I come from a long line of truly magnificent women. Not only do I come from a long line of magnificent women, they are incredibly faithful women. I won't tell you their stories of faith, because they're not mine to tell, but my mother and her mother have both experienced moments/situations/major problems that would have been easy to justify losing faith and losing hope. But that's the thing...neither one of them is afraid of working hard for what's important and for what's right. They have both held strongly to their faith and testimony in their Savior, Jesus Christ...and both have taught me that above all, to trust in Him and things will turn out for good. One way or another...they will turn out for good. "Have faith in yourself, faith in the Lord, and faith in the future." *Make obtainable daily goals. (Replace "lose 30 pounds" with "workout for 30 minutes today". Replace "Read scriptures for x amount of time" with "Read scriptures before turning on Netflix." *Surround yourself with great people who encourage, lift, and support. *Make sure to always have the Holy Ghost as your companion and guide. I find myself needing to make quick decisions daily as to what I need to do, what I need to say to a child, or how to react to a situation. I am way more confident in making these decisions if I'm living my life as best as I can. *Make a mental list (or write it down!) of all your blessings. It would SHOCK you how many things are great even though your world might be spinning. This just might be the hardest for me as it's the one I have the least control of, and I think the only way to have faith in the future is by working on the things you *can* control. *As I've been thinking about "what can we control? ", (because, sometimes, doesn't it feel like the answer is-nothing?) the answer is really...your attitude. You can control your attitude and your outlook on situations. Having a positive attitude, working as hard as we possibly can, being kind when it seems impossible, forgiving when it seems too hard.....these things will allow us to feel and believe that even though we don't know where life will take us....we can do the absolute best we CAN do and the future won't seem quite so shady. So here's something else I've been thinking about lately. While I'm doing middle-of-the-night feedings with Sadie, I don't turn on the lights or make any noise because I need her to know that it's night time. To keep myself awake, though, I scroll through my phone and honestly most of the things I see are insane. People are mad at each other and mad at the world. Terrible things are happening to good people. Facebook groups showcase a ton of complaints that are first world problems to the extreme. (I need to stop late-night scrolling...that's the answer and I know it.) All of this makes me realize that the need for PEACE in this world and in our homes and in ourselves is so, incredibly important...especially during the time we're living in now. I encourage you, over the next few days, and especially as Easter approaches, to check out mormon.org for a truly beautiful video on finding peace in your life. There are also incredible stories and wonderful challenges to participate in that go along with each of the 8 principles mentioned above. Ooooh yeah, if I were doing middle-of-the-night feedings Facebook would not be my go-to option for staying awake :( You're right in that we can control our own attitudes, and fostering peace in our own lives is a great start. On a happier note I love that picture of four generations of your family! I love this. Thank you for sharing! I think I'm going to steal your little boys reading scripture during morning get ready routine. What a great idea! Thank you for sharing this amazing meeting. Take the time to enjoy your little ones. I so miss that time with my girls. I'm with you! I get so discouraged if I scroll too long on social media, there is so much nasty negativity in the world. But we all have to remain positive and optimistic about our own blessings!! :) God is so good! 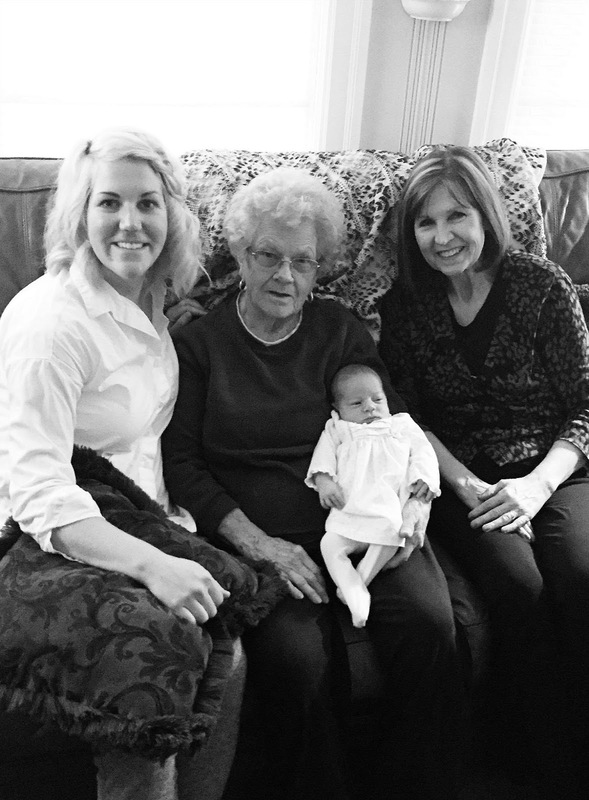 Love that you got a 4 generations photo, so sweet!! That's something you'll treasure forever! I feel the same way about social media. I can't pay attention too much or I feel angry as well!